I did a Facebook Live the other day where I admitted that I was just stuck. Not for lack of ideas or desire to do things, not even because of a lack of motivation. I just was stuck. 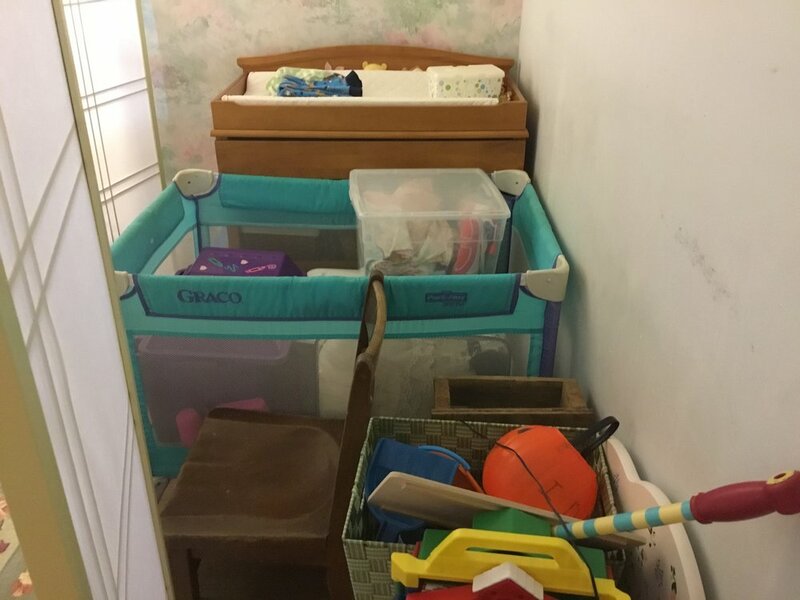 Over the past few months I have pigeonholed my office into one corner of the room I am using, the other 3/4 of the room being for the porta-crib, changing table, toy box, piles of toys, including three shelves of my bookcase taken up with toys that the kids could easily reach. Wait! What? The grandkids stay over maybe once a month, twice maybe. Why for 1/4 of the weekends in a month do they get 3/4 of my room? More mathematically speaking, why do they get 9/10ths of my room for the 1/10th of the time they are here? Then on top of it I was really regretting getting the large screen Mac — it was too close, too high, and just generally unenjoyable to use. 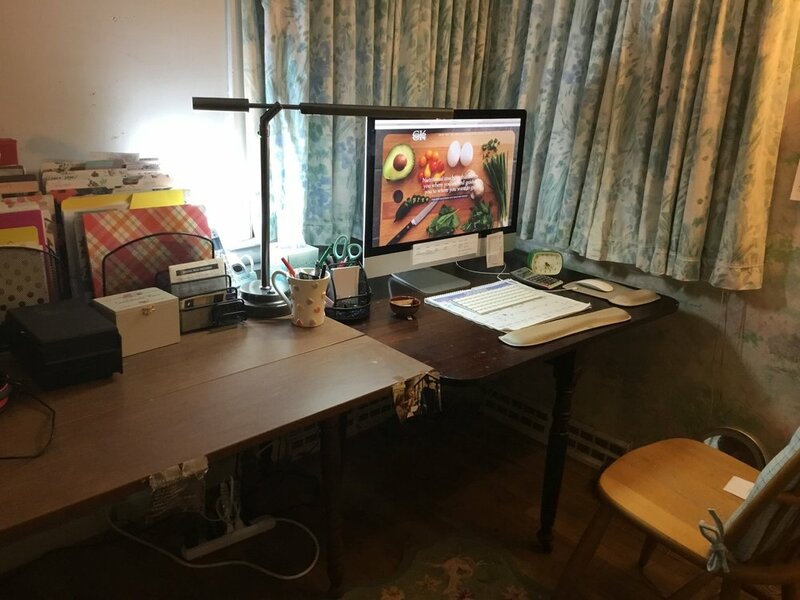 Then the desk — by the time I had my calculator and papers to do recipes, folders for clients, books, podcasting gear and lighting gear, I felt cramped, uncomfortable and unable to move forward in my endeavor to grow Granny Keto. I needed more room for myself. I needed more desk space. I needed a comfortable way to use my computer. I needed to stop being distracted by the house we are trying to buy and what I will do with that office if I ever get it. I had to stop feeling closed in and claustrophobic every time I put up the wall divider screen to separate me from everything else. I had to figure out a way to enjoy what I had been been dreaming of doing ever since I took my first class in becoming a nutritional counselor. I just sat quietly yesterday morning over my first cup of coffee, then the second one. It came to me! I tightly compacted (is that redundant?) the changing table, porta-crib, toy box and toys against one of the walls and put my divider screen up against that and angled it in a way that you see only the screen from the open doorway, but then the view is into my office area. Then I remembered that I had an antique table in my basement (not being used for anything) that sat lower than the piece of furniture I was using for a desk (an old kitchen table). I brought that upstairs, did some rearranging, got a higher chair which, combined with the lower table, makes a perfect height for this monstrous computer — no more straining my neck to look up to read the screen. And voilà! Before I put my head on my pillow last night I did a Facebook Live, pre-recorded two YouTube videos, met with clients, and still had time to try out a new recipe for Granny’s Table. I felt so invigorated and HAPPY. Years ago there was a whole movement about if you lose your clutter, you lose your weight. I think actually there is a lot of truth to that. I always do much better on a diet when my house is clean and peaceful and I am calm inside. Part of it is that when you are not crazed with disorganization and stress you can attend to other things (like cooking and eating well). But I wonder how much of the inability to lose weight when you are crazed and cluttered and claustrophobic has to do with a rise in cortisol or stress on your adrenal glands. Having everything calm and peaceful and reducing that stress goes a long way in helping your body adjust to doing what it needs to do to be healthy and fit. I have also talked about the tumultuous year I have had with the deaths of my mother and sister, my husband’s ruptured aortic aneurism, my abrupt retirement with its financial and personal adjustments, our house hunting, and just everything else in between. But a year is enough. Time to look forward (and what perfect timing — it is a new year after all). Time to be relaxed and happy and organized and Zen. Maybe I will be Granny Zen this year! Change: What’s not to like?